In that hybrid organization, money trumps morals, duty to country and the public interest. It is a shrine to crony capitalism, infused with lawyers who believe “it’s legal if you can get away with it.” Just as Wall Street’s watchdogs suffer from regulatory capture, the Wall Street Democrats are afflicted with “cognitive capture,” a polite way of saying public officials covet the wealth they hang around with on Wall Street and expect equal earning power when they pass through the gold-plated revolving door. After former President Bill Clinton signed Citigroup’s dream deal in 1999 to repeal the depression era Glass-Steagall Act that separated insured banks from gambling casinos on Wall Street, then U.S. Treasury Secretary, Robert Rubin (another Wall Street Democrat) who lobbied for the repeal, quickly beat a path to Citigroup’s door where he received compensation of more than $115 million over the next decade. 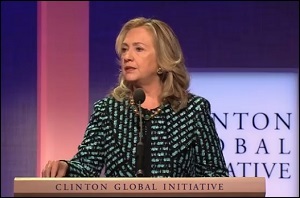 After Bill Clinton left the White House, Citigroup paid him hundreds of thousands of dollars in speaking fees and committed $5.5 million to the Clinton Global Initiative – a program that has become controversial over fears that corporations and foreign governments were attempting to curry favor with Hillary while she was Secretary of State by making donations to the related Clinton Foundation. What is not in question is that mega Wall Street banks likes JPMorgan Chase and Morgan Stanley along with the largest Wall Street law firms are in the top 20 of Hillary’s current campaign donors, according to the Center for Responsive Politics. The Center notes that the “money came from the organizations’ PACs; their individual members, employees or owners; and those individuals’ immediate families. At the federal level, the organizations themselves did not donate, as they are prohibited by law from doing so.” Just as we would have suspected, Paul Weiss, the law firm that was Citigroup’s go-to guys for serial fraud charges, made the cut. Hillary’s transparently vapid proposals to tinker around the tattered edges of the Wall Street Democrats’ Dodd-Frank illusion of reforming Wall Street (after two of America’s largest banks became admitted felons just five months ago) rather than breaking up the banks and restoring the Glass-Steagall Act, should instantly disqualify her as a serious candidate for the Oval Office among Democrats who are not afflicted with cognitive capture or the cognitive dissonance of a bifurcated Democratic Party. Tomorrow evening, Hillary will debate four other fellow Presidential candidates in the first Democratic debate, to be held in Las Vegas. For a preview of why Senator Bernie Sanders of Vermont, who voted against the repeal of Glass-Steagall and strongly advocates its return, is attracting large crowds across America, take a look at the video below. Also on stage will be former Governor of Maryland, Martin O’Malley (another advocate for restoring Glass-Steagall), Lincoln Chafee, a former Rhode Island Governor and Senator, and Jim Webb, author and former Senator from Virginia.